Made in the USA is a tag that means something over here. Sort of. At least it means it wasn't tiny-hand crafted by children in a third-world sweatshop. Supposedly. But, I digress. 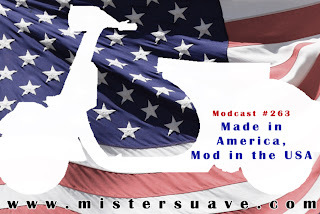 The point today is that made in the USA means mod in the USA. Worldwide, the modness out there is almost palpable. Spain. France. Russia. The Netherlands. Philippines. Is there anywhere a mod band won't pop up these days? Short answer is no. From the four corners of the earth we've got slick dressed chicks and dandified dudes. And all of them are backed up by a lot of sixties inspired, soul infused, garage rockin', freakbeat driving, pogoing powerpop, music. And hey guess what: I ain't talkin' about Britain. This is America, we're having our own little mod revival going right here in these good ol' United States. That right, this week's show is all Mod in the USA. 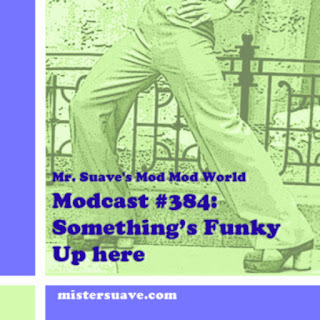 All American bands representing different approaches to the mod scene -- soul bands, power pop bands, garage rock acts, I've got it all covered for you. So right here right now you can briefly stop being an anglophile and you can appreciate all the great American mod sounds. Suedehead sound great. And a little bit like a band called Beat Union whose album I have but I know nothing about. Are they in any way related, do you know? Did some research myself: Same singer obviously, Dave Warsop.